Once you’ve had a homemade apple pie, nothing else can compare. What sets it apart? A tender, flaky crust that can only be achieved when made by hand. 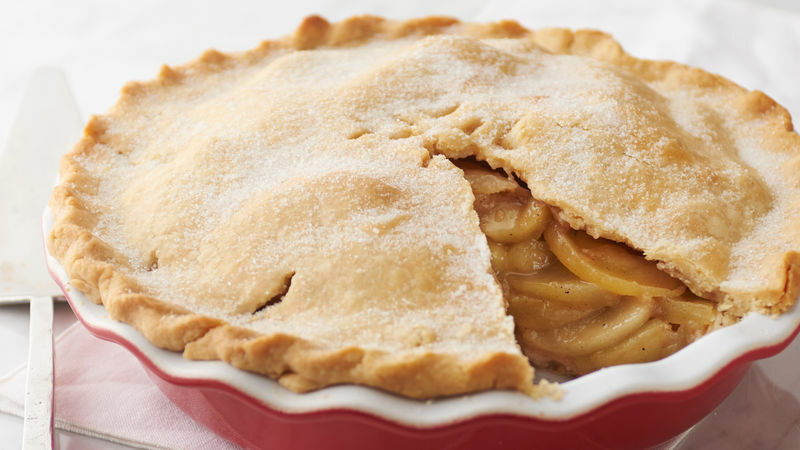 If you’ve never baked an apple pie from scratch before, follow our practical step-by-step guide and you’ll be a pro in no time. 1. In medium bowl, mix flour and salt. Cut in shortening, using pastry blender or fork, until mixture forms coarse crumbs the size of small peas. Sprinkle with water, 1 tablespoon at a time, tossing with fork until flour is moistened. 2. Gather pastry into ball. Divide in half; shape into 2 flattened rounds on lightly floured surface. Wrap rounds in plastic wrap and refrigerate 45 minutes. 3. Heat oven to 425°F. Using floured rolling pin, roll one pastry round on lightly floured surface into a round 2 inches larger than upside-down 9-inch glass pie plate. 4. Fold pastry into fourths and place in pie plate or roll pastry loosely around rolling pin and transfer to pie plate. Unfold or unroll pastry and ease into pan, pressing firmly against bottom and side. 5. In large bowl, mix sugar, ¼ cup flour, the cinnamon, nutmeg and 1/8 teaspoon salt. Stir in apples. Spoon into pastry-lined pie plate. Cut butter into small pieces; sprinkle over filling. Trim overhanging edge of pastry ½ inch from rim. 6. Roll other round of pastry into 10-inch round. Fold into fourths and place over filling, or roll loosely around rolling pin and place over filling. Unfold or unroll pastry over filling; cut slits in pastry for steam to escape. 7. Brush top crust with 2 teaspoons water; sprinkle with 1 tablespoon sugar. Cover edge with pie crust shield ring or 2-to 3-inch strip of foil to prevent excessive browning; remove shield or foil during last 15 minutes of baking. 8. Bake 40 to 50 minutes or until crust is golden brown and juice begins to bubble through slits in crust. Cool on cooling rack at least 2 hours. Now that you’ve got the fundamentals down, start exploring all of Betty’s best pie recipes.